After declining ticket sales, viewership and tourist numbers, Malaysia has no interest at all in holding another Formula One event next year. 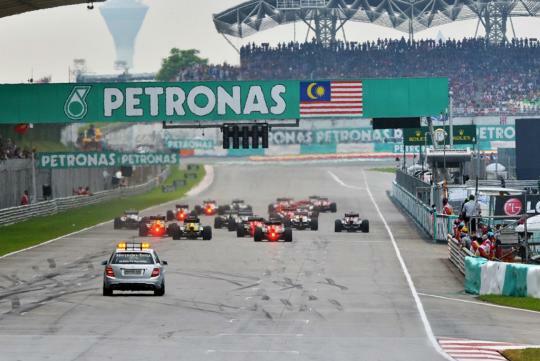 According to Reuters, Sepang circuit Chief Executive Razlan Razali said before the race that Malaysia would not want to host Formula One after this year’s final grand prix there even if it was offered to the country for free. Only 46,944 spectators turned up for the race last year, a slight improvement on 2015 but well off the 88,450 who came to watch in 2013. Razali expected about 80,000 spectators. In contrast, tickets for next month's MotoGP race, which the track will continue to host, are already sold out. Other than the aforementioned reasons, Razali has also complained in the past about the cost which he said made the government-backed event financially unviable. Adding on, he said that he had struggled to convince fans to turn up because the show had not been exciting enough. "Even if we got the greatest of deals, do it for free for example, what’s the product?” he said. "I myself am not able to sit in front of the television and watch from lap one until whatever lap (for) two hours. It’s hard to sell this kind of event and to get bums on the seat...and it’s not worth the investment at the moment." Razali said Malaysia, whose circuit is popular with drivers, would be happy to come back if Formula One delivered a show that would bring in the fans and keep them on the edge of their seats. Time for S’pore to bite the bullet and follow in the shoes of M’sia after the recently renewed 4-year contract ends. The F-1 AngMoh told our Minister,"S'pore a very important Country for F-1",that Minister so happy,quickly signed 4 Years.